Indianapolis Airport is FedEx's "national hub". The planes take off in a constant cycle a few minutes apart. 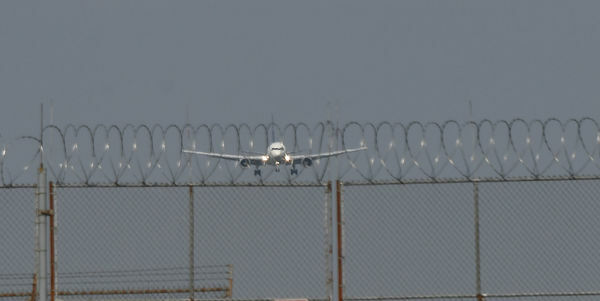 This shot was interesting to me because the plane clearing the barbed wire shows the security efforts around our airports these days. Barb Wire, Yep, Sure is a sign of the times. However to me that bird sure looks like it is landing. Have to agree JR69-he looks to be in a descent angle and not a take-off angle. That plane is definitely landing and Memphis is the nationalnhib of Fedex. Sorry to say you're all wrong. It was taking off. went right over my head. And Indy is the "national" hub for FedEx. Memphis is the "international hub"
No landing lights in the rear, only by the engine intakes. Landing. I remember as a younger man i used to go to the airport and take pictures of planes taking off and landing. I don't think it's a good idea anymore. You probably will get questioned about what your doing. I don't need the hassle. Plenty of other things to photograph. Sorry Ike but this airplane is in the landing phase of flight. Glide-slope angle is 3.5 degrees, which looks almost flat. Take-off attitude in today's modern aircraft is a MUCH higher deck angle. As for the wire, it has been there at least since 1970, just went unnoticed until the media discovered it. Too bad Fed-Ex chose Indy-a-no-place, worse radar room in the business. You can say it because as you can see, I can’t say it clearly. What you are calling barbwire is really called concertina wire and is really sharp. True barb wire will not coil like that. Concertina is used where high security is needed without having to use a lot of man power. Big users of this is the prison system and the military in combat zones to protect perimeters along with roving patrols.